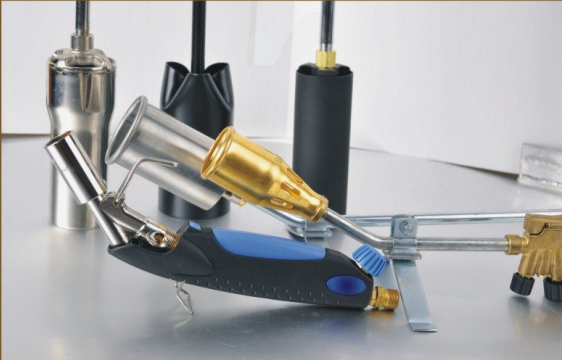 Product categories of Heating Torch, we are specialized manufacturers from China, Heating Torch, Propane Gas Torch suppliers/factory, wholesale high-quality products of Lpg Heating Torch R & D and manufacturing, we have the perfect after-sales service and technical support. Look forward to your cooperation! Heating Torch is also called flamethrower gun, it is a heating and welding tool using liquefied gas as its fuel. When used correctly, the utility model can reach a high temperature of 1300 degrees, and has the advantages of low cost, safety, convenience, no pollution and stable performance. Roofing Torch is suitable for mechanical parts heat treatment (quenching), foundry industry (core baking), roof mending (melting asphalt), boat maintenance, meat processing industry (shed), communication cable maintenance, pipeline maintenance, old paint drying shovel plastic melting, jewelry processing, wood products baking, granite surface smooth processing and winter car starting heating etc.. Stainless steel extension of the LPG Heating Torch can be 7.5 cm, 10 cm, 15 cm, 20 cm, 35 cm, 50 cm, 60 cm, 75 cm, 100 cm or as per your requirement.